The Powers of Mustard Greens are endless. If you haven’t tried them yet or just haven’t seen or heard about them you may want to explore the unknown and bring them straight to your plate. They are much like spinach, kale and or collards in that they have a bite and are most oftenly prepared steamed or sauteed. You can enjoy them many ways including raw in a salad or incorporated into a dish. Below we will discuss the healing powers of healthy mustard greens. We will also have some recipes up-coming featuring these powerful cruciferous greens. As an excellent source of vitamin C, vitamin E, beta-carotene, and manganese, mustard greens give us highest level support for four conventional antioxidant nutrients. But the antioxidant support provided by mustard greens extends far beyond these conventional nutrients and into the realm of phytonutrients. Hydroxycinnamic acid, quercetin, isorhamnetin, and kaempferol are among the key antioxidant phytonutrients provided by mustard greens. This broad spectrum antioxidant support helps lower the risk of oxidative stress in our cells. Chronic oxidative stress—meaning chronic presence of overly reactive oxygen-containing molecules and cumulative damage to our cells by these molecules—is a risk factor for development of most cancer types. By providing us with a diverse array of antioxidant nutrients, mustard greens help lower our cancer risk by helping us avoid chronic and unwanted oxidative stress. As an excellent source of vitamin K and a smaller but reliable source of omega-3 fatty acids (in the form of alpha-linolenic acid, or ALA), mustard greens provide us with two hallmark anti-inflammatory nutrients. Vitamin K acts as a direct regulator of our inflammatory response, and ALA is the building block for several of the body’s most widely used families of anti-inflammatory messaging molecules. While glucobrassicin (a glucosinolate found in many cruciferous vegetables, and the precursor for the anti-inflammatory molecule indole-3-carbinol) does not appear to be present in mustard greens in significant amounts, other glucosinolates present in mustard greens may provide important anti-inflammatory benefits and are the subject of current research. Researchers have looked at a variety of cardiovascular problems—including heart attack, ischemic heart disease, and atherosclerosis—and found preliminary evidence of an ability on the part of cruciferous vegetables to lower our risk of these health problems. Yet regardless of the specific cardiovascular problem, it is one particular type of cardiovascular benefit that has most interested researchers, and that benefit is the anti-inflammatory nature of mustard greens and their fellow vegetables. Scientists have not always viewed cardiovascular problems as having a central inflammatory component, but the role of unwanted inflammation in creating problems for our blood vessels and circulation has become increasingly fundamental to an understanding of cardiovascular diseases. While glucoraphanin (a glucosinolate found in many cruciferous vegetables, and the precursor for sulforaphane, an isothiocyanate with important anti-inflammatory properties) does not appear to be present in mustard greens in significant amounts, other glucosinolates present in mustard greens may provide important anti-inflammatory benefits and are the subject of current research. A second area you can count on mustard greens for cardiovascular support involves their cholesterol-lowering ability. Our liver uses cholesterol as a basic building block to produce bile acids. Bile acids are specialized molecules that aid in the digestion and absorption of fat through a process called emulsification. These molecules are typically stored in fluid form in our gall bladder, and when we eat a fat-containing meal, they get released into the intestine where they help ready the fat for interaction with enzymes and eventual absorption up into the body. When we eat mustard greens, fiber-related nutrients in this cruciferous vegetable bind together with some of the bile acids in the intestine in such a way that they simply stay inside the intestine and pass out of our body in a bowel movement, rather than getting absorbed along with the fat they have emulsified. When this happens, our liver needs to replace the lost bile acids by drawing upon our existing supply of cholesterol, and as a result, our cholesterol level drops down. Mustard greens provide us with this cholesterol-lowering benefit whether they are raw or cooked. However, a recent study has shown that the cholesterol-lowering ability of raw mustard greens improves significantly when they are steamed. 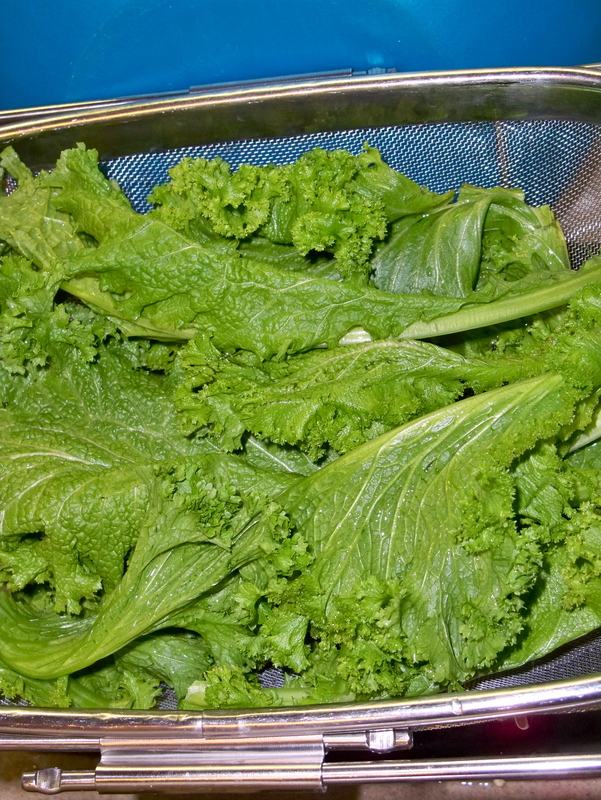 In fact, when the cholesterol-lowering ability of steamed mustard greens was compared with the cholesterol-lowering ability of the prescription drug cholestyramine (a medication that is taken for the purpose of lowering cholesterol), mustard greens bound 34% as many bile acids (based on a standard of comparison involving total dietary fiber). In addition to the support factors described above, it’s impossible to talk about the cardiovascular benefits of mustard greens without mentioning their exceptional folate content. These greens provide just over 500 micrograms of folate in every hundred calories. That’s a nearly unsurpassed amount amongst the most commonly eaten cruciferous vegetables. (Only turnip greens score higher among the World’s Healthiest Foods.) Folate is a critical B-vitamin for support of cardiovascular health, including its key role in prevention of homocysteine build-up (called hyperhomocysteinemia).